Sunbridge Institute’s Waldorf Elementary Teacher Education program provides appropriate credentials and practical, artistic, and philosophical foundations for successful Waldorf teaching in grades one through eight classrooms. Graduates are conferred a diploma in Waldorf Teacher Education. This program enrolls every summer. Applications are now being accepted for the summer 2019 cohort. Regular application deadline: May 1; intensive dates: July 8-26. The goal of Sunbridge’s Elementary Teacher Education program is to help guide each new teacher in his or her development as a person and an educator. We strive to develop capacities that give you the means to teach out of yourself and, in turn, help you to develop the unique capacities of your own students. Through course work and observation, you’ll come to know why Waldorf teachers do what they do, and out of this understanding you’ll come to learn what you need to do. Through experiences in the arts—learning how to play the recorder, perform eurythmy, sing, paint, draw, sculpt, and do handwork—you’ll develop meaningful insights into the role of the arts in human development. 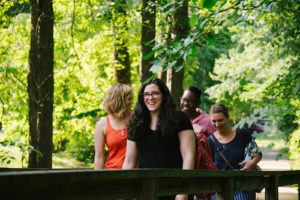 Through thoughtful dialogue, assigned reading, and guidance, you’ll have the opportunity to develop a contemplative inner practice that will enhance your teaching and assist you along the lifelong, transformative path of becoming a Waldorf teacher. You’ll be given countless tools for your Waldorf teaching, including suggestions for curriculum, materials, and invaluable support in both Sunbridge classrooms and Waldorf teaching classrooms. The program consists of courses in the following areas: basic Waldorf pedagogy and child development, subject curriculum and methods, inner development of the teacher, fundamentals for the teacher, anthroposophy, and artistic development. Besides attending 15 weeks of on-campus classes, every course has assignments to complete while on campus or at home before the end of that term. This program carries a requirement for practical experience working in a Waldorf classroom. 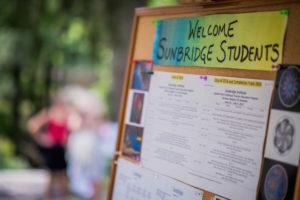 If you’re currently “in-service” (a full-time practicing Waldorf class or subject teacher—as is typically about a third of each entering class) you will be connected to a Sunbridge mentor who is a highly experienced Waldorf elementary teacher. This mentor will observe you in your classroom setting for a two-day visit during each year of the program. These visits will be accompanied by two hours of telephone conferences as a precursor and/or follow-up to the visits, and will include a self evaluation. (Note: These mentor visits are intended to support new teachers while they are in the Sunbridge program and are not intended as evaluations.) Ideally, your mentor will remain the same for the length of the program. Over the course of the three years, mentored teachers are also required to spend two additional practicum weeks in a classroom other than their own and in the presence of an experienced Waldorf teacher. If you’re “pre-service” (that is, not currently teaching in a Waldorf school, an essential component of the program in each of years two and three will be to complete four consecutive weeks of student teaching in an AWSNA-affiliated Waldorf school with an experienced Waldorf elementary teacher. All students (pre-service and in-service) are required to observe in a Waldorf classroom for a minimum of five days as follows: One full day in early childhood, three full days in elementary, and one full day in high school. Pre-service teachers are required to complete these five days in year one of the program. In-service students may complete the observations over the course of the three year program. Pre-service students are also required to observe for an additional two weeks in either one or two grades one-eight classes, spending a minimum of five consecutive days in one classroom at a time. These two full weeks of observation can take place at any point during the three years of the program. This brings the total observation requirement for pre-service students to three weeks. This summer, to mark the historic occasion of Waldorf Education’s 100th anniversary, our Elementary Teacher Education program will be recreating Rudolf Steiner’s first Waldorf teacher training course. The Foundational Teachers’ Course of 2019: Experiencing Rudolf Steiner’s Seminal Three-Part Lecture Series in the Context of 21st Century North America will comprise the entire summer curriculum for all our elementary students, as we follow the same schedule Rudolf Steiner and his original teacher education students—the first cohort of Waldorf educators—experienced in August-September 1919. From jointly reading and discussing Steiner’s three main texts (Foundations of Human Experience in the morning, Practical Advice to Teachers at midday, and Discussions with Teachers in the afternoon), to engaging in eurythmy, singing, speech, painting and drawing, we will celebrate a momentous century of Waldorf Education, exploring Steiner’s thoughts and methods and considering them through the lens of our current time and place. Don’t miss this unique opportunity! Apply to join our entering cohort today! Combine your Elementary Teacher Education studies with coursework from one of our specialized subject intensives (Elementary Music Teaching or Grades 1-12 World Language Teaching) and graduate with a diploma in Waldorf Elementary Teacher Education with a concentration in either Music or World Language teaching. For more information on this opportunity, contact Admissions Coordinator Penelope-Myles Voss, at info@sunbridge.edu / 845-425-0055 x20. Sunbridge Elementary Teacher Education program students or graduates wishing to earn a fully-accredited master’s degree may seek to apply their Sunbridge learning toward earning a Master of Education degree with self-designed concentration in Waldorf Education through our partnership with Empire State College of The State University of New York. Completion of or enrollment in a Waldorf teacher education program is generally a prerequisite of employment for Waldorf class teachers. Sunbridge Institute is a full member of AWSNA (the Association of Waldorf Schools of North America) and our Elementary Teacher Education program offers a full teacher training. Please note that our diplomas are not academic degrees, as they reflect clock hours, not credits. Due to fluctuations and variations from state-to-state in the U.S. regarding requirements for teaching credentials, it is important to research your state’s regulations regarding requirements to be licensed to teach in a private or public school. Please see our Teacher Education Program Overview for more information on Waldorf teacher education at Sunbridge Institute. Learn more about Waldorf Education. Read a Sunbridge article in the Fall 2016 issue of Lilipoh magazine on Waldorf teaching and grades teacher education.